← Cheap flights to Mongolia from Geneva for only € 347 (RT) or with a stopover in Beijing for only € 370. Marrakesh is a major city of the Kingdom of Morocco. It is the capital city of the mid-southwestern region of Marrakesh-Safi. Located to the north of the foothills of the snow-capped Atlas Mountains, Marrakesh is situated 580 km (360 mi) southwest of Tangier, 327 km (203 mi) southwest of the Moroccan capital of Rabat, 239 km (149 mi) south of Casablanca, and 246 km (153 mi) northeast of Agadir. 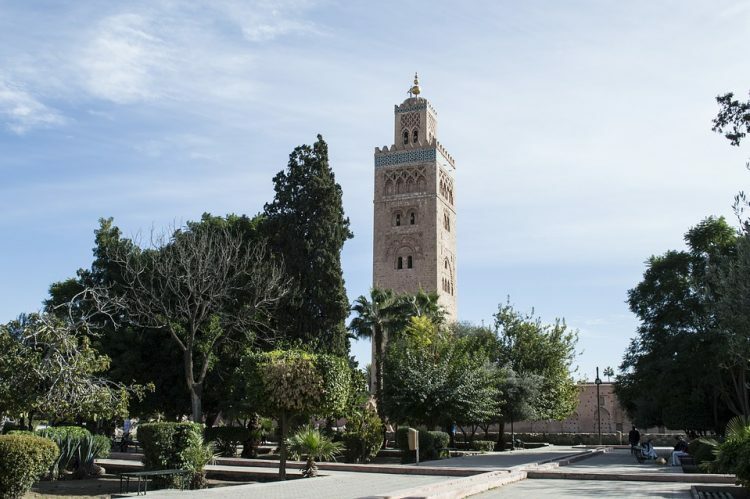 Like many Moroccan cities, Marrakesh comprises an old fortified city packed with vendors and their stalls (the medina, a UNESCO World Heritage Site), bordered by modern neighbourhoods, the most prominent of which is Gueliz. Today it is one of the busiest cities in Africa and serves as a major economic centre and tourist destination. Marrakesh is possibly the most important of Morocco’s four former imperial cities. Marrakesh is a place that travelers either love or hate. But it’s also one of these places where you need to adjust your expectations accordingly and be prepared that it’s a place like no other. There are plenty of hostels & luxurious riads in Marrakesh and they’re all very cheap.